In semi-surprising news, Derek Carr will be the starter in Oakland over Matt Schaub. 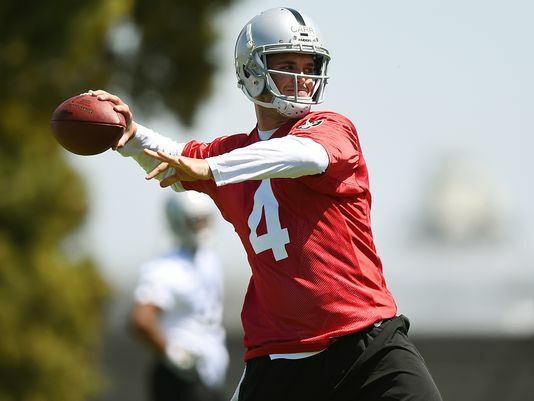 Carr will officially be the first quarterback from this rookie class to see action. We should know quickly what his long-term prospects will be. After cutting Dion Lewis and Chris Ogbonnaya, and Terrance West failed to impress, Ben Tate is in line to be a work horse in Cleveland. His stock is on the rise. Backup quarterback Ryan Mallett was traded to Houston over the holiday. He’s expected to back up Ryan Fitzpatrick and help raw project Tom Savage. We don’t see Mallett being a prospect anytime soon. If anything, it helps Jimmy Garoppolo’s dynasty stock. Giants receiver Odell Beckham is still nursing a hamstring injury. His dynasty stock continues to drop due to inactivity. This entry was posted in Daily Update and tagged ben tate, chris ogbonnaya, derek carr, Dion Lewis, jimmy garoppolo, matt schaub, odell beckham, ryan fitzpatrick, ryan mallett, tom savage. Bookmark the permalink.